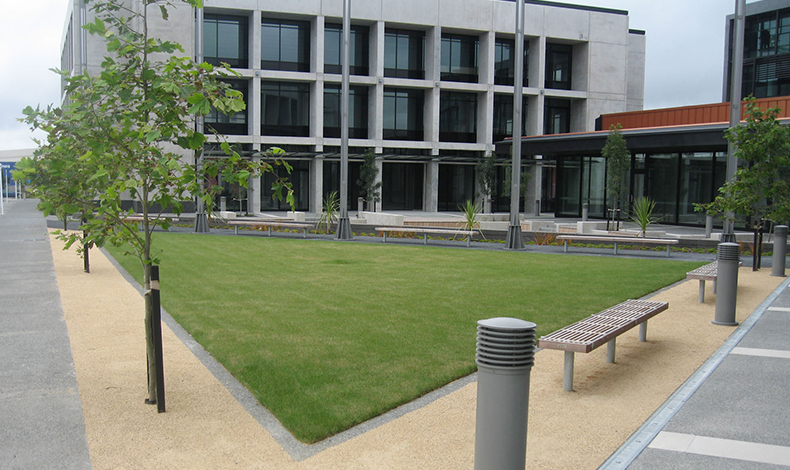 Hazeldean Business Park is a commercial facility developed by Calder Stewart Industries on the southern side of the Christchurch CBD. It sits within a mixed commercial/industrial/residential context. The completed business park includes six office buildings, a standalone cafe, childcare centre, secure car park and public open space. Hazeldean Road, which divides the northern and southern parts of the site, was redeveloped in conjunction with the first stage of business park construction works. Particular design features of the site include the creation of a central open space and the integration of Hazeldean Road into the business park. The central open space provides a green sanctuary for the business park users amongst the dominant surrounding architectural forms. Boffa Miskell originally provided masterplanning, design and documentation and contract management services for the project. More recently Boffa Miskell has documented, tendered, managed and observed the contract for earthquake sitework repair at Hazeldean Business Park.